Situated in the picturesque town of Lake George: The Great Escape Theme Park is a thrilling vacation destination for visitors to upstate New York. Lake George is one of the beautiful towns located in the scenic Adirondack Mountains. In fact, Thomas Jefferson once wrote that Lake George was the most beautiful lake in the country. This year-round tourist destination typically welcomes the most visitors during the summer months when the lake is more hospitable for swimming and boating. The quaint village features a main street of shops, boutiques and restaurants. Many visitors take in the lake and the nearby excitement of The Great Escape Theme Park for a truly well rounded vacation. Originally named Storytown USA, this park got its start in 1954 as a small theme park that celebrated Mother Goose nursery rhymes. Over the years, the park expanded to add Ghost Town and Jungle Land to appeal to older visitors. In 1983, the park was renamed The Great Escape and the Six Flags corporation took over the theme park in 1996. Now known as The Great Escape & Splashwater Kingdom, the park has expanded to over 140 acres. Overall, there are more than 135 rides, shows and attractions. The Great Escape offers traditional amusement park rides as well as water thrills in the Splashwater Kingdom water park. The Tornado: One of the newest water rides at the park is The Tornado, a five story, 5,000 gallon water ride that sends guests swirling through a giant funnel. The Comet: Rated as one of the top wooden roller coasters in the country, The Comet reaches speeds of 50 miles per hour and a height of 95 feet. Alpine Bobsled: This sled-like coaster is a unique experience for guests of The Great Escape, featuring a trackless ride that reaches speeds of 35 miles per hour. Boomerang Coast to Coaster: This ride reverses at the start, then shoots riders through corkscrews and loops reaching 45 miles per hour, before traveling backwards to the start again. Desperado Plunge: This family flume ride provides cooling relief on a hot summer day. Twister Falls: This twisting, turning inner tube ride in the Splashwater Kingdom is sure to delight park guests. Paul Bunyan's Bucket Brigade: A five-story tree house that offers plenty of opportunities for all ages to get soaked. The Fest Area of The Great Escape features traditional amusement park rides, such as flying swings, a Ferris wheel, go-carts, a gondola ride, and spinning amusements. The Storytown area of the park still remains, featuring Mother Goose characters, Cinderella's coach, a petting zoo, carousel, and the Storytown train. Looney Tunes National Park, a themed area specifically for children, features railroad and airplane rides, a small child-sized rollercoaster, and a themed restaurant. The Great Escape & Splashwater Kingdom is open from Memorial Day through Labor Day, as well as weekends through October. General admission tickets are $41 for visitors over 48 inches tall ($36 if purchased online) and $26 for those under 48 inches. Children two and under are free. Season passes may be purchased for $70 and group discounts are available. Parking is $10-15 per day, or a season parking pass can be purchased for $25. A Flash Pass can be purchased for an additional $10, allowing guests to reserve a time slot for a number of rides. 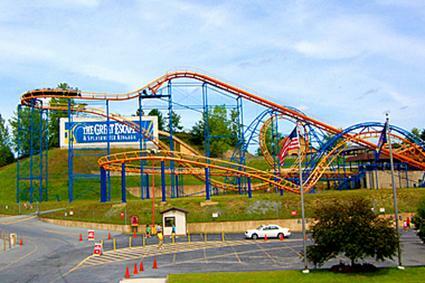 The recently built Six Flags Great Escape Lodge & Waterpark is located across from the Great Escape amusement park. The resort features a 38,000 square foot indoor water park to extend the fun throughout the winter season. Guests can take advantage of offers that combine lodging, The Great Escape theme park and the indoor water park. Rooms at area motels and bed and breakfasts are also available, but many tourists enjoy renting a home on the lake for the ultimate Lake George experience.